Drumheller's Little Church opened to the public on July 9, 1958. Reverend Edgar C. O'Brien of the Pentecostal Church came up with the idea. He wanted the church to be a place of worship and meditation and not just a tourist attraction. Reverend E.C. O'Brien contracted Robert 'Bob' Gibson to design the church. Gibson also hand painted the original windows portraying Christ teaching the Apostles. Tyvge 'Tig' Seland was responsible for constructing the original church with donated materials. Throughout the years, the church has been rebuilt/repaired many times. The most recent rebuild being in 2015 after it sustained vandalism and fire damage in October of 2014. The sign out front states Drumheller's Little Church – Seating 10,000 People – 6 At A Time. I'm sure that number has been passed many times over. 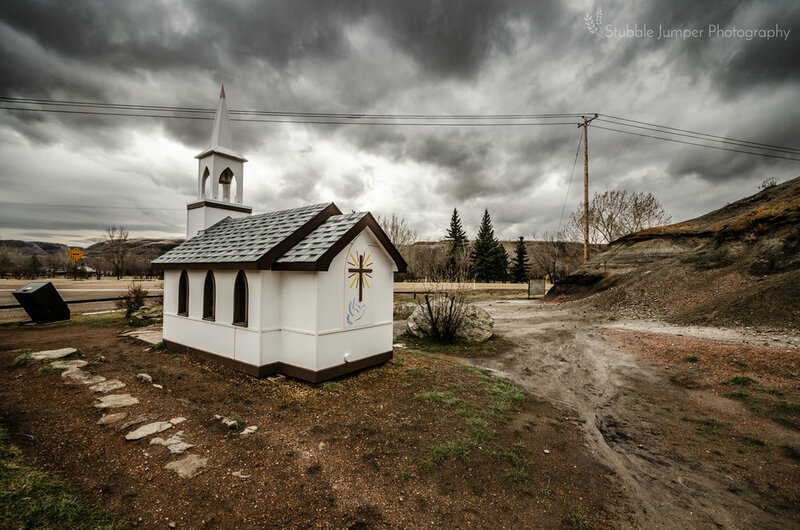 Drumheller's Little Church has stood the test of time and remains a popular tourist attraction in the Drumheller Valley.